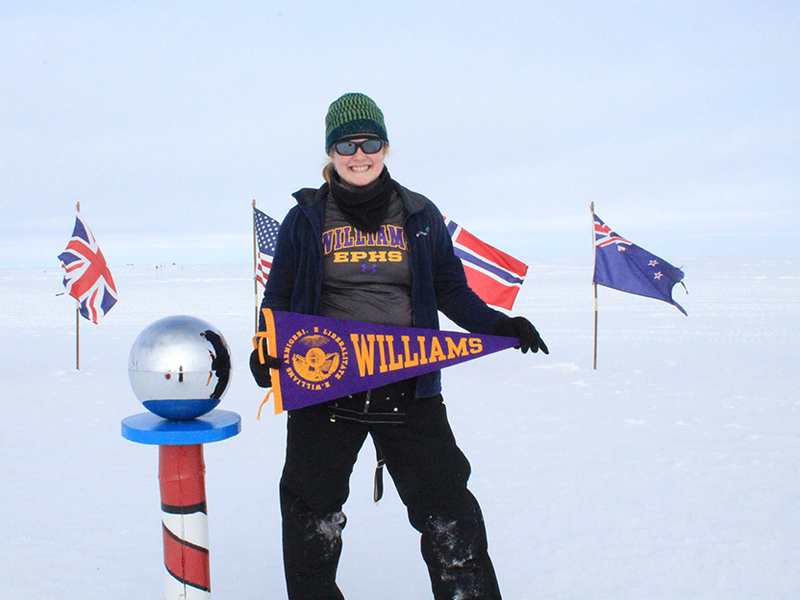 Nurse practitioner Jaime Hensel ’05 recently returned from her second austral summer on the South Pole, where, between Halloween and Valentine’s Day, the sun never sets and the average temperature hovers around minus 18 degrees Fahrenheit. The Amundsen-Scott Station, the U.S. scientific research station at the South Pole, has a summer population of 160, and Hensel served as one of two medical care providers to that community. “When I first arrived, it was minus 50 and daylight, flat and white in every direction for as far as I could see,” says Hensel, who majored in psychology and concentrated in maritime studies at Williams. She says she’s always loved small communities and the opportunity to experience the natural world—that’s what brought her to Williams. It’s also why she sailed on tall ships for several years after graduation. So the South Pole made sense to her as a destination. Hensel graduated from the Yale School of Nursing in 2013, moved to Seattle and worked at a community health center for the un- and underinsured. Finally—after three years of applying—she was hired as a nurse practitioner by the University of Texas Medical Branch, which has the Antarctic contract with the National Science Foundation, the manager of the U.S. Antarctic Program. She spent her days treating colds and the flu, frostbite, cracked skin, nosebleeds, minor injuries as well as acute mountain sickness, since the South Pole sits approximately 9,300 feet above sea level. “I’ve learned really interesting things about medicine that I never would have learned in Seattle,” Hensel says. And she spent evenings playing the violin with other musicians at the station, telling stories and attending—or giving—public lectures.